Mary DeRouchey, age 87, of Milbank, died August 20, 2018, at St. William’s Care Center. Mass of Christian Burial will be on Saturday, August 25, 2018, at St. Lawrence Catholic Church at 11:30 a.m. with Bishop Paul Swain as Celebrant. Visitation will be Friday, August 24, 2018, at St. Lawrence Catholic Church from 5-7 p.m. and continue one hour prior to the service on Saturday. 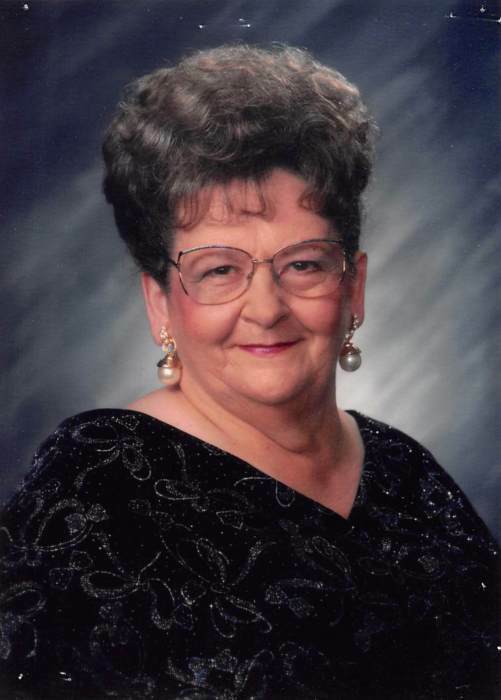 Burial will take place at St. John‘s Catholic Cemetery in Harold, SD, at 5:30 p.m.
Mary Henrietta DeRouchey was born on December 30, 1930, in Sully City near Harold, SD to James and Eugenia (Hollerich) Schmitgen. She grew up on a farm north of Harold. She attended schools through the eighth grade at a country school, and a Catholic School in Polo, SD. While working at the local restaurant she met Carol Jerome DeRouchey. They were united in marriage in Miller, SD on July 19, 1952. From this union, they were blessed with three daughters and six sons. Mary and Carol continued to reside on the family farm. She worked a variety of jobs, including janitor, banker, and bookkeeper. Her last employment was as a night shift worker for the Lil' Feller Convenience Store. Carol was a truck driver and passed away in February 2003. Mary attended St. Ann’s Catholic Church in Miller and was involved with the altar society. She was a member of the VFW Auxiliary. Mary enjoyed quilting and crocheting. Mary made hundreds of quilts and afghans, which she gave away. She was very generous with her gifts to others. She liked canning, playing cards, and dominoes with family and friends. She loved cats, especially her cat, “Molly”. Mary was a long time resident of Miller, until November of 2014 when she moved to Milbank. Cherishing her memory are her children: Carolyn “Tootie” (Les) Gaudig; Marilyn Billings; Doug DeRouchey; William (Kathy) DeRouchey; Nancy (Wayne) Johnson; Robert (Dana) DeRouchey; Fr. Gary DeRouchey; and Jerry (Sara) DeRouchey; sister, Margaret Pope; nine grandchildren; and five great-grandchildren. Preceding her in death was her husband, Carol; son, Jamie; grandson, Chad Gaudig; brother, Clarence; and sister, Katherine Ogle.